Home Wellness	Can education prepare you for a freelancing career? Here we go with another Q&A. This week in the United States, you may have heard about our Presidential Election. If you’re still running on no sleep like me, this week’s question on preparing for a freelancing career might be the one for you. Freelancer Basics is a look into my life as a work-from-home woman and mother. I don’t always get it right, but I keep going, one step, one day and one job at a time. Did your education prepare you for what you’re doing now? I love this question because it points out a key necessity for a successful freelancing career; resourcefulness. In my opinion, if you’re forward thinking enough to ask a question like this and you continue to do so, you’ll do just fine in a freelancing career. That said, working-from-home as a parent or even if you don’t have kids is quite challenging. Take this week for instance. The shocking results of the Presidential Election has kept many of us up at night watching the news and having hard conversations. Yet, like I mentioned in this week’s newsletter (subscribe here!) we still have to wake up and move on and do our jobs. For many of us, that means leaving the house and going to an office. But for freelancers, shutting down the distractions around the home is crucial and many times difficult. In some ways, I do think my education – rather the way I received my education – paved the way for my success. I spent my childhood from third grade until high school graduation as a home-schooled student. There was some structure, but the day to day managing of my studies was left to me (with the occasional nudge from mom, ahem). I loved learning at home and the freedom it afforded me at a young age. But it also taught me self discipline and that resourcefulness I have come to rely on. As a college student at NC State here in Raleigh, I attended classes and did my work, but actually found it more difficult to sit in class than to just do the reading and figure it out. This was probably more of an adjustment for me than for those who attended traditional public schools growing up, but I am thankful for both experiences because I learned different skills from each. Obviously, if you weren’t home-schooled, you can’t really go back and change that. But if you are considering a freelance career, you might take a few self-paced e-courses on a topic that interests you and train yourself to create systems and strategies on your own time, without the oversight of a teacher or employer and see how you do. Thankfully, like I mentioned last week, there are college courses now that are designed to give students a grasp of what a freelance career is like. I think classes like this are fantastic and definitely recommend adding it to your schedule if you are in school. But the great thing about freelancing is there is always something to draw from whatever education you have and use it to compliment your current career. My degree is in Political Science: International Affairs with a minor in Spanish. You might think, wow she isn’t using that degree at all! And I’ll tell you why I use it every day. A major in politics forced me to study and learn about cultures all over the world and how to communicate in a productive way. My minor in Spanish gave me language studies that brought me closer than ever to communities outside my particular circle. I may not be fluent anymore, but having learned about and visited other countries in my studies, my worldview was absolutely affected. The way this translates to my freelance career is first and foremost a strong grasp of communication skills. So much of my work is in writing, whether it be on a blog or elsewhere, via emails or client presentations. I am using the skills I learned daily even if I am not on Capitol Hill or an Embassy in Spain. And that’s where the resourcefulness comes back into play. As a freelancer, you really do get to build your own career using the pieces of your own puzzle. That’s part of what makes it so exciting and also part of what makes us unique. There is a very personal aspect to this lifestyle and I think that’s a really good thing. 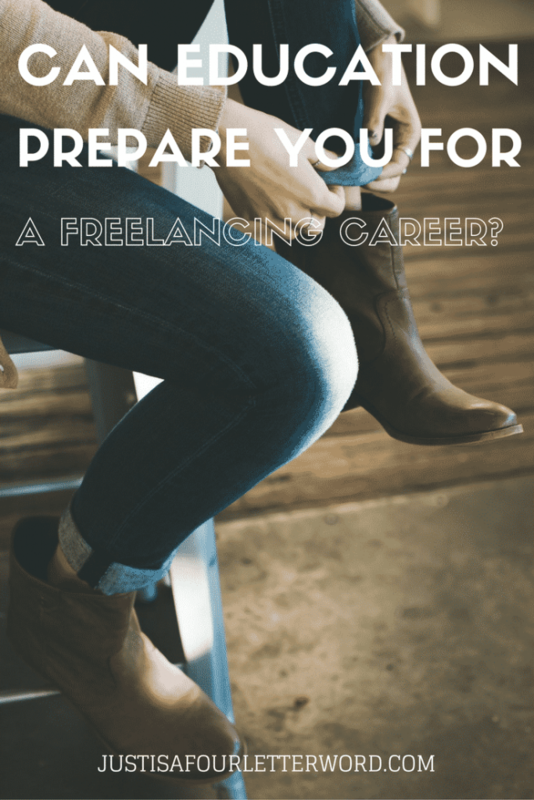 Are you thinking of a freelance career or already in one? What are 3 skills you are using as a result of education? Tell me in the comments! Like this post? Pin it for later or share the love using the social buttons at the top. Thanks for reading! I’ll be answering questions weekly so if you have one, comment below or shoot me an email at andrea@justisafourletterword.com.